s The Contact Manager quickly organizes all your contacts with great features like storing documents, organizing by groups, printed and electronic correspondence, history, todos and much more. Fully unlocked and no licensing! Technical support is not included with purchase. The Contact Manager for FileMaker Pro 12/13/14/15/16/17 is a CRM (Contact Relations Manager). Features include electronic and printed correspondence, mass emailing, group organizations, todo lists, document management, history of correspondence and much more. The Contact Manager comes with the full access password when you purchase it so you can modify it to meet your own needs. It also has no licensing fees so you can modify it as much as you like and deploy it as many times as you like for a single price. compatible with FileMaker Go 12/13/14/15/16/17! Download a demo copy of the Contact Manager for FileMaker Pro version 12/13/14 by clicking the download link at the bottom of the screen. 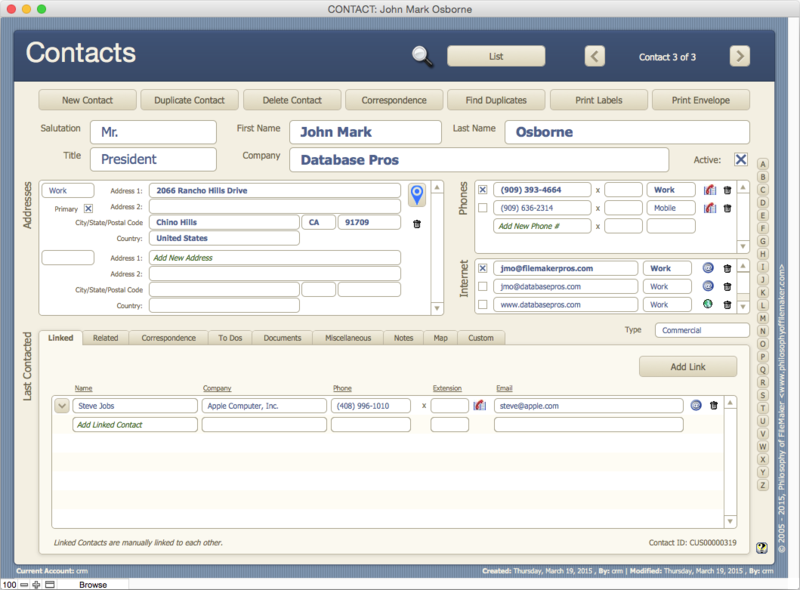 Purchase the Contact Manager for $99.95 and get the full access password. There are no royalty fees for distribution when incorporating it into your own solution. Unlimited Addresses, Phone Numbers and Emails storage. 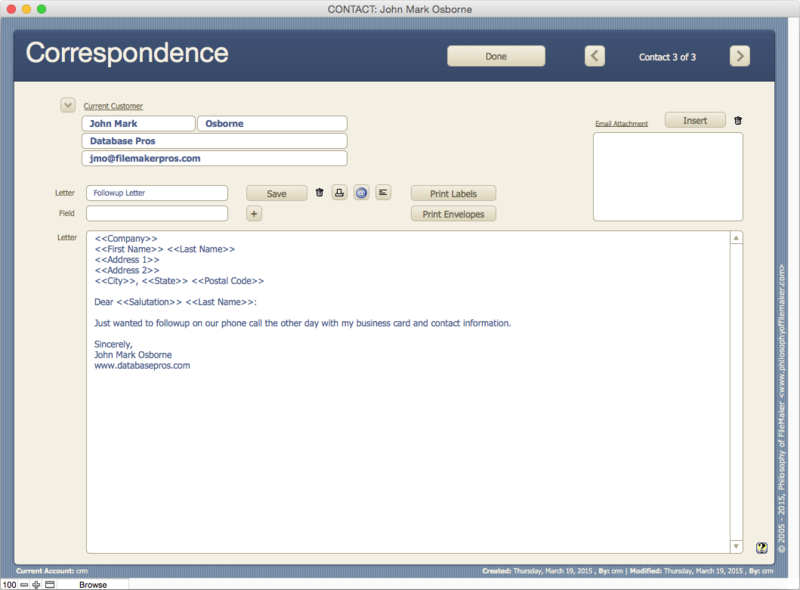 A complete correspondence system that allows for merge email, letters, SMS with history. To Do items with a reminder system. Royalty free use of the template! And, there's much more so download a demo (see below). 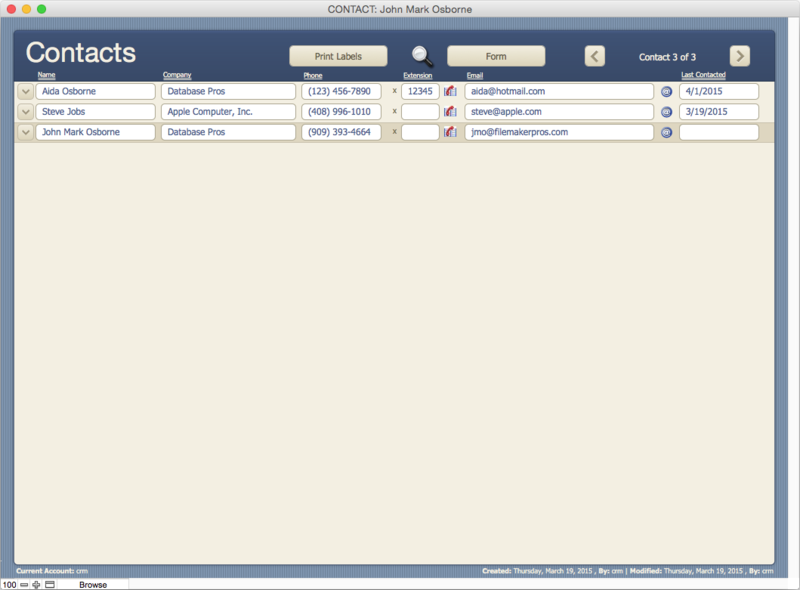 Download a demo of the Contact Manager now!